Despite the director’s expectations — they supposedly attended the premier with pockets full of rocks should a horrified audience become violent — the film was well received. In a sad twist, both of the leading actors of the film eventually committed suicide. Pierre Batcheff overdosed on Veronal in a hotel in Paris in 1932, and Simone Mareuil doused herself in gasoline and burned herself to death in a public square in Périgueux, Dordogne in 1954. In the ensuing years since its debut Un Chien Andalou has been recognized as a seminal moment in the history of cinema, a staple of any film buff’s diet. Now the FAM can rest easy, knowing that there is at least some modicum of credibility found herein should it be placed under the glaring eye of some future, internet historian. And just remember, it’s only a cow’s eye. The Icelandic volcano Eyjafjallajökull has received a fair bit of attention of late. Not unexpected, buy cialis considering that its insidious ash cloud momentarily brought air travel in the vicinity of Europe to a standstill. No doubt, advice this is some sort of evil, ailment Nordic plot, the ins and outs of which are of no concern here. What we wish to call attention to here is the footage above, a bit of geological geekery. As the volcano continues to erupt one can see the shock waves from each explosion of magma ripple through the plumes of smoke and debris. Such is nature that it can be so beautiful and fascinating in its destruction. 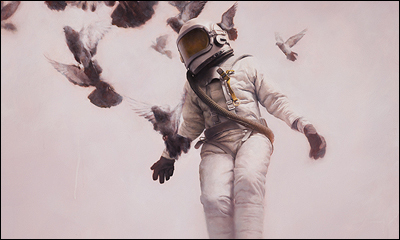 Jeremy Geddes, an accomplished artist from Australia, is working on a series of cosmonauts that has me wishing for a modern, minimally-decorated living space so that I may grace my walls with his work. Whether they’re suspended in monochrome space, seemingly ascending with flocks of doves, or floating across barren cityscapes, these cosmonauts’ head-to-toe space armor makes them into blank representations of ourselves. 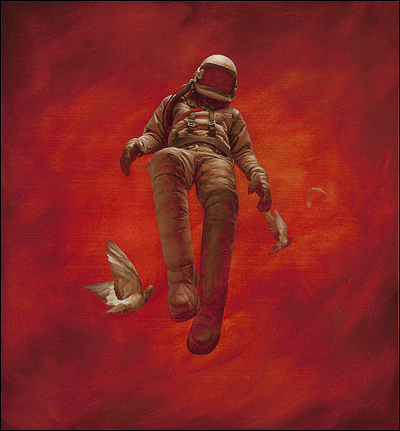 Almost any emotion can be projected into these paintings: is the cosmonaut doing a happy air dance, or is he dead in his suit? Or maybe they’re just awesome space people, placed into aesthetically-pleasing, universally-appealing settings. OK, the title of the piece above leaves less to the imagination, but I prefer to think of him merrily romping through the empty, radioactive streets, enjoying the lack of gravity. Geddes has consistently said that he wants these pieces to raise questions, rather than answer them, which is precisely what makes me love them more each time I look. Whatever the case may be, this series is gorgeous beyond belief. There are more, bigger cosmonauts on Geddes’ website. Click the jump for two more images here. 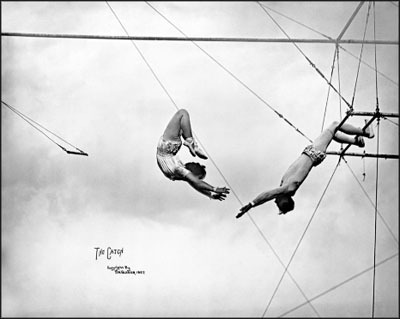 Via Russell Joslin (editor of the inestimably cool SHOTS Magazine) comes this New York Times article about the photographer Frederick W. Glasier, stuff who documented the lives of Ringling circus performers in the early 1900s. Coilhouse readers are strongly urged to view these photographs in full screen mode at the NY Times site. Heyday, a full exhibition of Glasier’s work –much of it never presented before now– begins May 15 at the Ringling Museum in Sarasota, Florida. 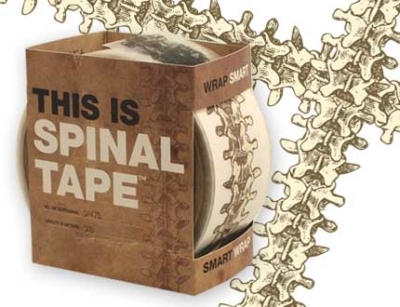 I am certain there are those who would follow Mer’s amazing Cenobite accessory post with something a bit more weighty with content, a bit more elegant than this. Those people are, I am almost as certain, more talented than I. It seems that I am, in fact, just a sucker for a really excellent pun. And thus my private shame is now made public. Danielle Nicole Hills is a metalsmith based in Brooklyn, NYC. 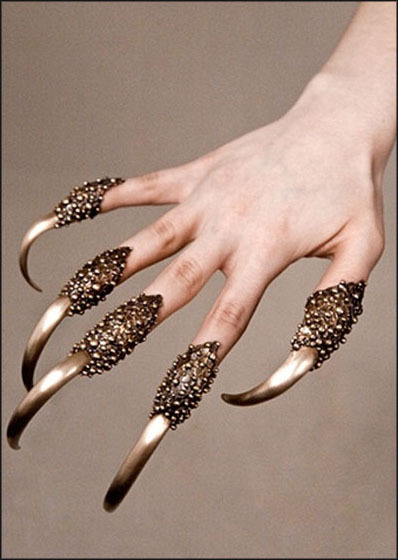 This week, photos of her wicked “Predator Rings” (for sale in her Etsy shop at $900 per five-fingered pair, or $200 per digit) have been making the rounds on the interwebs. Predator Rings by Danielle Nicole. (All photos via her Etsy store or personal site. The impulse to adorn and improve the body in some way is an instinctual commonality throughout the world. The cultural motivations for personal adornment are innumerable, but the way in which people do this is fundamentally the same. I focus on creating a codependent relationship between adornment and the human form in which they both redefine the other. 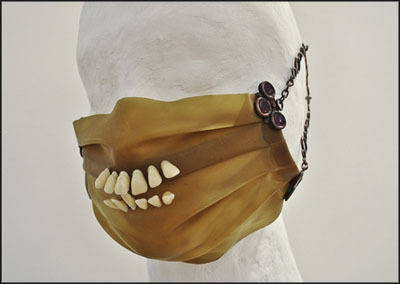 Each piece, when worn, removes the body from the context of modern society, emphasizing instinctual decorative practices. By creating an aggressive dichotomy between subtle, elegant forms and vicious primal instinct I am able to transform the frame of reference the wearer is displayed in. The extravagant theatrical nature of each piece makes the concept of ritual and ritual adornment fundamental to the work. Dang! Talk about heavy metal. Several more fierce pieces by Hills after the jump. This image just mysteriously showed up on my portable hard drive. No idea where it came from. 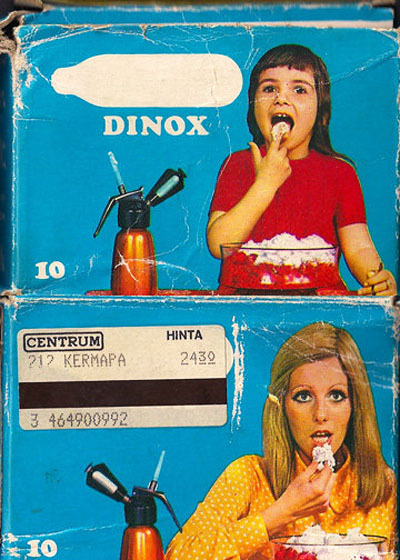 It appears to be vintage packaging for nitrous cannisters, ostensibly used for whipping cream. But judging by the blonde’s glassy-eyed, idiotic stare, the gas may have been used for more, um, unsavory recreational purposes. Just in time to put you off your lunch, the Friday Afternoon arrives with 2009’s Food Inc, the scathing documentary/critique of America’s food industry. Directed by Robert Kenner and co-produced by Fast Food Nation author Eric Schlosser, Food Inc is of the variety that both infuriates and terrifies in equal measure. It must be pointed out, however, that if you are already up on the subject matter, or have already read Fast Food Nation, there isn’t a whole lot that is new here. Still, for those uninitiated in the horrific practices of companies like Monsanto and Tyson it can be an eye-opening experience. Recently, it was shown on PBS for their POV segment — it can be viewed on their website until this coming Thursday, should the YouTube version get pulled — and was followed with the delightfully Lynchian Notes on Milk (Click that link to watch. Do it!) a short film looking at the rise of milk in America. So get to watching, dear readers, and get a better picture of the horrible stuff we put into our bodies everyday. In the meantime I’ll get back to my Big Mac, because nothing tastes quite like Creutzfeldt–Jakob. Update: Reader rbk points out that PBS is not viewable in America’s hat, Canadia. Therefore, filthy Canucks should go here. 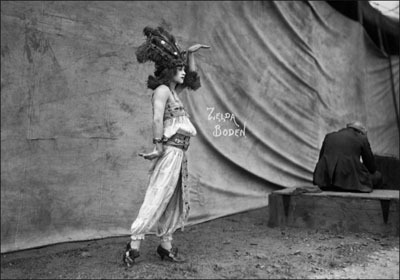 Born in 1897, Lucille Bogan first began recording in 1923, singing vaudeville songs. By the 1930s she had established herself as a blues singer and her oeuvre was slanted decidedly toward the raunchy. In songs like “Sloppy Drunk Blues”, “Tricks Ain’t Walkin’ No More”, and “B.D. Woman’s Blues” (the B.D. stands for bull dyke) she focused on themes like gambling, drinking, lesbianism, and prostitution; themes that featured prominently in the juke joints she had worked in early in her career. One of her last recordings, “Shave ‘Em Dry” in March 1935, had two versions, one that kept to the tamer innuendo of most blues songs and an unexpurgated version, featured above, which does away with subtlety altogether. An interesting little piece of historical titillation, if only for a retort to the “music today is morally bankrupt” argument often favored by the familial old-guard.